It has a been just over a year since I first discovered the stock quote app MarketCast in the Fire TV appstore. The developer told me about some significant new features he has added to the app, so I decided it was a good time to take another look. With new features like live updates, historical charts, and new headlines, MarketCast is easily still the best way to view stock market quotes and information on any Fire TV device. The core functionality of quickly and easily seeing the latest prices of stocks you’ve selected is as good as it has always been. You use the app’s search function to find stocks and add them to one of the three groups. Each group of stocks is displayed on the main screen of the app as a horizontally scrolling row that displays the current price and price change in dollars and a percentage. Selecting a stock brings up additional information about the stock including the 52 week high/low, market cap, volume, and more. information about the company is also displayed, like the year it had its IPO, the sector, and the industry. Added recently to the app is the new ability to view historical charts for each stock. A click away are charts for the last week, month, year, and five years of the stock’s price. Each chart is scaled appropriately and displayed in fullscreen so it’s easy to read from across a room. I would have liked to be able to flip through the different charts using the right and left buttons on the remote, instead of having to go back to the previous screen each time, but perhaps that’s something that will come in a future update. In the latest update, MarketCast has added the ability to view a stream of stock market headlines directly in the app. In the same way as you scroll through stocks, you can scroll through headlines. Selecting a headline allows you to read the first few sentences of the article. All of the app’s features come together in the app’s “Live” view. When selected, the Live view automatically cycles through displaying the latest stock prices, weekly charts, and news headlines. This allows the app to function almost like a stock market screen saver. You can configure the Live view to display only the information you want to see. If you don’t care about news headlines and just want to see passive information about your portfolio, you can easily configure the app that way. If all you want to see are the day’s latest prices or only a stream of charts, that’s easily achievable as well. MarketCast is a must have Fire TV app for anyone who wants to keep an eye on the stock market. The developer continues to improve the app even though it’s 100% free with no ads or in-app purchases, so I recommend taking a look if you’re interested at all in the stock market. I’ve never written an article for money. I have no plans to ever do so, but if that ever changes, I’ll make it absolutely clear that it’s a paid post. The developer of this app is a patron through Patreon, but this article has nothing to do with that support. I’ve always said I’m very thankful when developers reach out to me and tell me about their app updates, so I’m usually happy to return the favor by giving them a little extra coverage when it’s a slow news day. 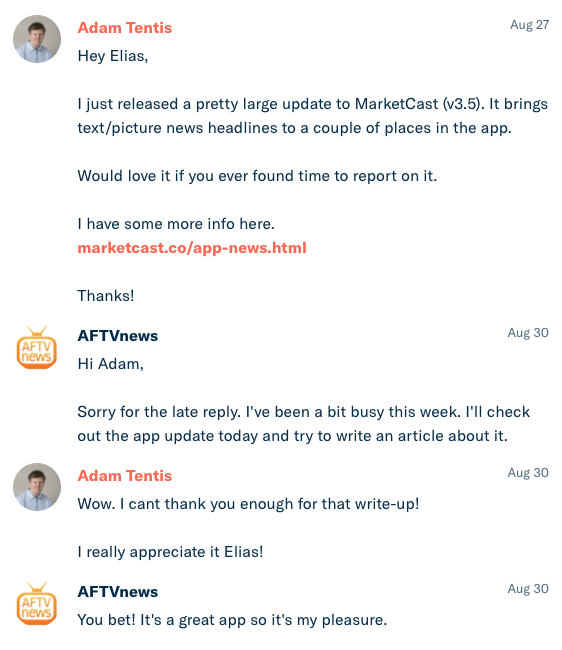 MarketCast’s developer has let me know about several of his app updates in the past, so I thought it was a good time to sum them up in a new article since the app just turned 1 year old.